Canadian Press is reporting that gas is bubbling and fizzing out of the grown in Weyburn, Saskatchewan where the world’s largest carbon capture and storage (CCS) facility is located. CCS had been hailed by some as the panacea to climate change in that the technology is able to capture carbon dioxide and inject it underground rather than releasing it into the atmosphere. Massive investments are being made in Alberta’s tar sands on CCS technology and any hope of reducing emissions is riding on the success of CCS. The federal government has even joined forces with the Alberta government to kick-start a plan for a $1.5 billion pipeline that would ship unwanted CO2 from utilities and oil sands production to old natural gas fields, and the Stelmach government in Alberta set aside $2 billion in the summer of 2008 for carbon capture and other mitigation projects. But now, a Saskatchewan farm couple whose land lies over the Weyburn facility says greenhouse gases seeping from the soil are killing animals and sending groundwater foaming to the surface like shaken soda pop. Skeptics of CCS have long-maintained that the technology is unproven and there is no way to guarantee that the carbon dioxide won’t leak at some point in the future thereby presenting serious health risks and undoing any emissions reductions that may have been realized. It’s expensive, unproven, and according to researchers at Duke University, there’s the troubling possibility that captured carbon could leak into groundwater aquifers, potentially rendering water undrinkable. This latest bad news for proponents of CCS adds to doubts about the technology’s effectiveness, particularly in the tar sands. A government report from 2008 stated that that just a small percentage of the carbon dioxide released in mining the sands and producing fuel from them can be captured. This will be my last comment in this exchange for reasons that I hope will become clear below. Thanks to Roger for his comments. I apologize for the delay in my response but, surprisingly, I do have more important ends to direct my energies. No amount of evidence I can present (and God knows there is a lot of it) seems to make any difference so this discussion has become somewhat akin to trying to convince an anti-Darwinian evangelical about the theory of evolution. At this stage, we’re going round in circles and we could go on for years like this. Roger cannot and will not bring himself to accept the possibility that human-caused climate change might just be happening. That’s fine. At least 95% of climate scientists believe otherwise but, still, it is his prerogative to believe what he wishes and he is of course entitled to his own opinion. After all, there are not an insignificant number of people alive today who still think the earth was created 6000 years ago or that smoking doesn’t actually cause cancer. The reader, on the other hand, may not have the time to seek out the “references” Roger has provided to assess their veracity, determine whether they were peer-reviewed, written by climate scientists (and not economists or geologists for example), or even whether the contents of these articles actually say anything to cast doubt on the widely accepted reality of climate change. To give just two examples, one of the author’s in his list, Robert Balling, has received more than $200,000 from coal and oil interests over the past six years, according to Harper’s magazine. Two other references are to papers by Ross McKitrick (an economist not a scientist) published in the infamous “journal” Climate Research which is notorious for a controversy from 2003 in which they published a paper written by Willie Soon and Sallie Baliunas, which prompted concerns about the peer review process of the journal and resulted in the resignation of several editors and the eventual repudiation of the paper by the publisher. Sound like a credible source? So, I address these comments, not to Roger, but to the readers of this exchange. For I trust that Roger will post my response, as he does all comments, on his blog for all to see. I ask you, kind reader, to suspend judgment and not to believe me or to believe Roger. After all, neither of us is an expert. Let’s instead look at what the American military (that bastion of socialists) has to say about human-caused climate change. But clearly all of these organizations are “politically-motivated” or part of the vast conspiracy, are they not Roger? I trust you will show us your list of scientific academies that do not endorse the consensus of human-caused climate change. Not yet swayed, reader? Wow, you’re a tough nut to crack. How about this then? * In 2004, Naomi Oreskes, a professor at the University of California, published a paper in the journal Science on a study in which she found that, of the 928 peer-reviewed journal articles written between 1993-2003 on global climate change, not a single one took exception with the idea that humans were causing climate change. * The national science academies of the G8 nations, plus Brazil, China and India, three of the largest emitters of greenhouse gases in the developing world, signed a statement stressing that the scientific understanding of climate change is now sufficiently clear to justify nations taking prompt action. * In 2007, the Network of African Science Academies submitted a joint “statement on sustainability, energy efficiency, and climate change”: A consensus, based on current evidence, now exists within the global scientific community that human activities are the main source of climate change and that the burning of fossil fuels is largely responsible for driving this change. No remaining scientific body of national or international standing is known to reject the basic findings of human influence on recent climate change. All a conspiracy you say? Alright then. I give up. The reality of human-induced climate change is no longer seriously in dispute. The facts are clear for all to see and even a cursory review of the scientific evidence is conclusive. It is so easy to refute climate deniers that it actually is quite fun, were it not so time-consuming and ultimately pointless. The problem is that deniers not only deny climate change, they deny the truth and will pick and choose only those small pieces of evidence that suit their ideological viewpoint. Case in point, let’s examine Roger’s comments one FINAL time. I have printed his latest comment in full including the references he cites. ROGER: Well first of all the IPCC is not a scientific organisation, it is a political organisation. WRONG. THE INTER-GOVERNMENTAL PANEL ON CLIMATE CHANGE (IPCC) IS A RESPECTED, SCIENTIFIC BODY THAT WAS SET UP IN 1988 UNDER THE UN ENVIRONMENT PROGRAMME AND THE WORLD METEOROLOGICAL ORGANISATION. MEMBERSHIP IN THE IPCC IS OPEN TO ALL MEMBERS OF THE UN AND WMO. ROGER: There might be hundreds of scientists whose work the IPCC uses but there are many thousands, including some of the ones the IPCC cites who oppose the IPCC conclusions, methods and AGW theory in general. WRONG AGAIN. THE ALMOST COMPLETE SCIENTIFIC CONSENSUS THAT THE CLIMATE HAS WARMED IN RECENT DECADES AND THAT HUMAN ACTIVITIES ARE TO BLAME HAS BEEN ENDORSED BY EVERY NATIONAL SCIENCE ACADEMY THAT HAS ISSUED A STATEMENT ON CLIMATE CHANGE, INCLUDING THE SCIENCE ACADEMIES OF ALL THE MAJOR INDUSTRIALIZED COUNTRIES (SEE ABOVE). A 2010 PAPER IN THE PROCEEDING OF THE NATIONAL ACADEMY OF SCIENCES ANALYSED 1372 CLIMATE RESEARCHERS AND THEIR PUBLICATION AND CITATION DATA TO SHOW THAT 97-98% OF THE CLIMATE RESEARCHERS (ROGER, THAT’S CLIMATE RESEARCHERS, NOT ECONOMISTS, GEOGRAPHERS AND GEOLOGISTS ETC) MOST ACTIVELY PUBLISHING IN THE FIELD SUPPORT THE TENETS OUTLINED BY THE IPCC AND THAT THE RELATIVE CLIMATE EXPERTISE AND SCIENTIFIC PROMINENCE OF THE RESEARCHERS WHO REMAIN ‘SKEPTICAL’ ARE SUBSTANTIALLY BELOW THAT OF THE CONVINCED RESEARCHERS. Roger: Here is a list of a few out of thousands of peer reviewed scientific papers who contradict every piece of evidence the IPCC has. Why didnt the IPCC use these? I’LL LET YOUR WORDS SPEAK FOR THEMSELVES. DENIERS LOVE TO SPEAK IN HYPERBOLE TO MAKE A POINT BECAUSE THEY HAVE NO ACTUAL EVIDENCE TO SUPPORT THEIR CLAIMS. THOUSANDS OF PEER REVIEWED STUDIES THAT CONTRADICT THE IPCC? REALLY? YOU’VE GIVEN US A MERE HANDFUL, SOME OF WHICH DON’T CONTRADICT THE IPCC AT ALL. OTHERS ARE NOT FROM PEER-REVIEWED JOURNALS OR ARE NOT WRITTEN BY CLIMATE SCIENTISTS. Roger: I seem to remember that more than a minority of german people opposed the Third Reich and most young people believed in the almost superhuman powers of Hitler until the end. That didn’t make their beliefs true or the regime any less rotten and manipulative did it? I AM GLAD WE ARE FINISHING OUR LIMITED TIME TOGETHER WITH THIS, YOUR FINAL ACT OF DESPERATION. YOU KNOW THINGS ARE GETTING BAD WHEN SOMEONE CHOOSES TO INVOKE NAZISM TO DEFEND THEMSELVES. ARE YOU SERIOUSLY COMPARING CLIMATE SCIENCE TO HITLER AND THE NAZI REGIME? SERIOUSLY? DO YOU REALLY WANT TO GO DOWN THAT ROAD? I’M ONLY PUBLISHING THIS COMMENT SO READERS CAN JUDGE FOR THEMSELVES. NOT ONLY IS THIS OFFENSIVE, IT TOTALLY MISSES THE POINT. YES, IT’S POSSIBLE THAT 97% OF CLIMATE SCIENTISTS ARE ALL WRONG ABOUT GLOBAL WARMING. I ACKNOWLEDGE THIS, HOWEVER REMOTE THE POSSIBILITY MAY BE. BUT IT IS ALSO VERY POSSIBLE (MUCH MORE LIKELY) THAT THEY ARE IN FACT RIGHT. IT’S A BIT LIKE CAR INSURANCE – I WOULD RATHER PAY FOR IT (AND I PAY A LOT) EVEN THOUGH I DOUBT I WILL GET IN AN ACCIDENT. BUT IN THE CASE OF CLIMATE CHANGE, WE HAVE A VERY HIGH PROBABILITY OF GETTING IN A VERY SERIOUS ACCIDENT IF WE DO NOTHING ABOUT IT. YET DENIERS STILL INSIST WE SHOULD INDEED DO NOTHING AND JUST TAKE OUR CHANCES. IF 97% OF AVIATION MECHANICS TOLD YOU AN AIRPLANE WAS UNSAFE TO FLY BUT 3% SAID EVERYTHING WAS FINE, WOULD YOU TAKE THE FLIGHT? Thank you again, Roger, for visiting my blog. Skepticism is good and healthy in science when it is based on substantiated, credible facts rather than misleading half-truths or outright lies. For whatever reason, you can’t seem to accept reality and there are many possible explanations for that. So be it. But your attempts to mislead are no longer welcome on my blog. I’ve given you more than ample opportunity to make your point. You can continue to do so to your heart’s content on your own blog. 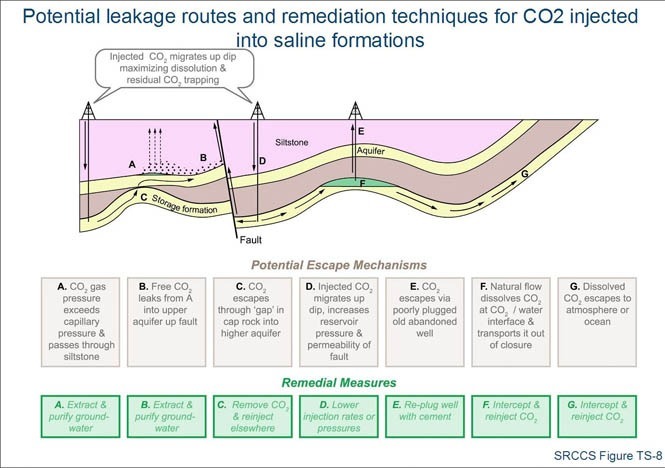 carbon capture and storage facility springs a leak � Earthgauge Radio”? Thanks for your question. The title of the post is legitimate and is based on a story that was reported in the Winnipeg Free Press, although the link now appears not to be working. In any case, a couple living near Weyburn reported that CO2 gas was leaking on their property from the Weyburn CCS test facility. Since writing my post, however, some scientists have questioned whether these reported leaks are actually related to the carbon capture facility. There appears to be some uncertainty about this. The couple in question continues to maintain that something strange is going on and they believe it is related to Weyburn. You can read more about the issue here: http://www.theglobeandmail.com/technology/science/alleged-leaks-from-carbon-storage-project-questioned/article562508/. My email is on the ‘About’ page (or at least it should be!). Anyway, send me an email at earthgaugeradio ‘at’ gmail.com. Thanks.